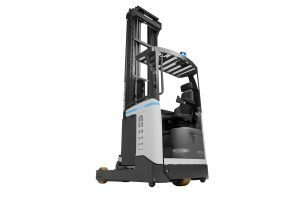 An additional product has been added to the ergonomic TERGO reach truck series from UniCarriers: the TERGO UHD 160 has formed part of the product family since April 2017 with its load capacity of 1.6 t and maximum lift height of 10.8 m. With this vehicle, UniCarriers is primarily focusing on logistics and industry operations which need to manage high handling capacities and access great stack heights. The numerous safety features on the UHD 160 ensure maximum stability for the vehicle and mast as they manoeuvre. The new TERGO UHD 160 displays its full capacity most notably when used for tough handling tasks and multi-shift operations. In its standard version, this reach truck achieves a maximum speed of 12.5 km/h and can even be optionally equipped to accelerate to 14.5 km/h, allowing users to reach high turnover and pallet flow rates. With excellent lifting and lowering speeds and the capacity to handle pallets of 1,000 kg above 10 meters the UHD 160 is the ideal choice for demanding warehouse applications. New stability programs help to optimise performance even further. One such program is the S3 Soft Motion System. Taking into account different factors such as the current lifting height, this technology analyses mast reach and mast tilt as well as sideshift, ensuring optimum stability. S3 is aided by the Mast Tilt Control System, or MTC for short, which stabilises the mast and reduces vibrations by up to 80 percent. Pallets are thus placed and taken out of storage very safely at a significantly faster rate. The enhanced Level Assistance System (LAS) helps to position loads at the right storage level, ensuring forks are automatically and precisely raised to the required height simply by automatically analysing the commands and intention of the driver. These new features are available for other models in the TERGO range from April 2017. It is vital that changing batteries does not cause unduly long downtimes when the forklift is used in multi-shift operations. Available as an option for the TERGO UHD 160, the semi-automatic Fast Track Powerplus System ensures batteries are replaced in around a minute. A charged battery is automatically hauled into the designated compartment on the forklift while the empty battery is transferred and connected to an unoccupied recharging station. As part of the ergonomic TERGO product family, the UHD 160 also impresses with all features which ensure comfortable, health-friendly work practices. These are effective in preventing employee absences due to medical conditions caused by repetitive activities. Key features on the vehicle include the low step in, the electrically adjustable floor and the fully adjustable seat with tilting backrest. The ergonomically optimised mini-steering wheel is used to control the forklift while the ErgoLogic multifunctional operating joystick initiates hydraulic functions.